Obesity is a disease that can be defined as an excess of body fat that is enough to impair health, welfare and quality of life. Obesity is not confined to humans. Pets are also susceptible to obesity. Although some diseases can cause pet obesity, the main reason that pets become obese is because the food that they eat contains more energy than they use up. This means that if pets eat too much or do not do enough exercise, they may become obese. 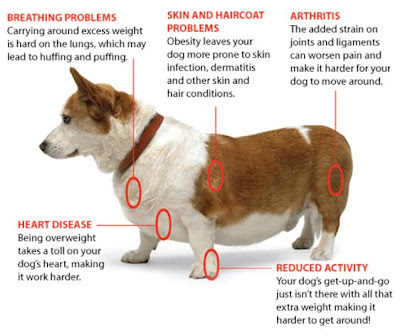 Global studies estimate that between 22 and 44 per cent of dogs are overweight or obese. Owners of obese dogs that are successful in losing weight notice significant improvement in their dogs' health-related quality of life, a collaborative team of researchers has shown. The research was conducted by scientists from the University of Liverpool (UK), the Pain and Welfare Group at the University of Glasgow (UK), ROYAL CANIN and the WALTHAM® Centre for Pet Nutrition - the science centre supporting Mars Petcare brands such as PEDIGREE® and NUTRO®. The study involved fifty obese dogs, representing a mix of breeds and genders that had been referred to the ROYAL CANIN Weight Management Clinic based at the University of Liverpool. Owners were asked to complete a standardised questionnaire to determine the health-related quality of life of their dog prior to weight loss. Owners of the thirty dogs that successfully completed the weight loss programme and reached their target weight then completed a follow-up questionnaire. The completed questionnaire responses were converted into scores corresponding to a range of factors, including vitality, emotional disturbance and pain. The results showed that quality of life improved in the dogs that successfully lost weight, as seen by their increased vitality scores and decreased scores for emotional disturbance and pain. The improvements in vitality score were greater the more body fat the dogs lost. The research also found that the dogs that failed to complete their weight loss programme had lower vitality and higher emotional disturbance scores than those successfully losing weight. "Obesity is a risk for many dogs, affecting not only their health, but also their quality of life," said lead study author, Dr. Alexander German from the University of Liverpool. "This research indicates that, for obese dogs, weight loss can be important for staying both healthy and happy." "Strategies for combating obesity and keeping dogs fit and healthy include portion control, increased exercise and diets specifically formulated for overweight pets", added study author and WALTHAM® scientist, Dr. Penelope Morris. Measurement of health-related quality of life is a key tool in outcome assessment for human medicine and is being increasingly adopted by veterinary professionals. Health-related quality of life tools give us a valuable insight into pets' wellbeing and can play an important role in assessing the impact of companion animal therapies. The research, Quality of life is reduced in obese dogs but improves after successful weight loss, has been published in The Veterinary Journal and is available for free online.